The picturesque town of Delft features a range of – lovingly restored – historic (canal) houses. 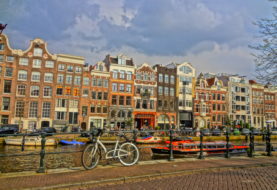 It is also not as pricey as the Dutch capital city Amsterdam or nearby The Hague. Thus, Delft makes for an ideal destination for history buffs, art fans and budget travellers alike. Delft is just a 30 minute tram ride or a 5 minute train ride away from The Hague – the political heart of the Netherlands as well as the seat of the International Court of Justice and the International Criminal Court. Cities like Rotterdam, Dordrecht, Gouda and even Amsterdam are also quickly reached by train. Thus, it makes sense for budget‐conscious travellers to book accommodation in Delft and then go to other Dutch cities on day trips. 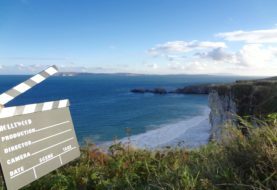 For more info on how to get around in the Netherlands, check out my Netherlands Travel Guide for Film Fans. You can see this view of Delft’s Town Hall and the New Church in the back several times in the film "Girl with a Pearl Earring". The most famous film associated with Delft is certainly the period drama Girl with a Pearl Earring (2003). 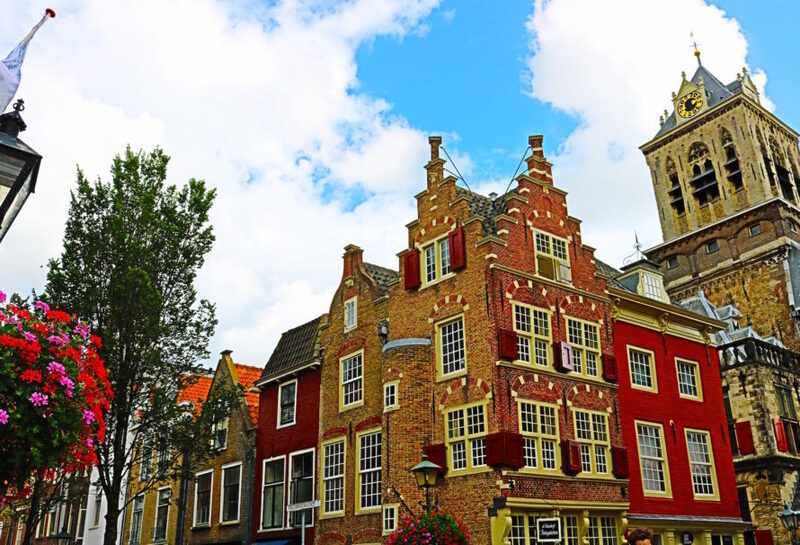 Even though it has mostly been shot elsewhere (namely Belgium, Luxembourg and Amsterdam), the city of Delft is the main and real‐life setting of the story about the Delft painter Johannes Vermeer (1632–1675) and his most famous portrait painting. 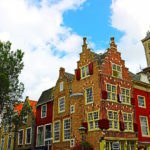 Read more about how you can trace the film's settings and the footsteps of Johannes Vermeer in my post 7 Fun Ways to Trace the Settings of "Girl with a Pearl Earring" in Delft, the Netherlands. Delft’s historic city centre is small and compact and can thus be easily explored by foot. You could also get a day card for 6,50 € from Delft’s tourism information point VVV Delft (Kerkstraat 3). With this card, you will have unlimited 24h use of all busses and trams in Delft as well as nearby The Hague. Or do as the locals and rent a bicycle! Stroll along the Market Square – Delft's main square still looks almost the same as in 1665 and served as a film location backdrop in Girl with a Pearl Earring. Go on a Canal Boat Tour – a fun and relaxing way to see the city and so quintessentially Dutch! … you'll find the location for Vermeer's "Little Street"
… go to the Beestenmarkt – a typically Dutch market square with several restaurants and bars. On my first night in Delft, I had dinner (and a delicious dessert) at the "De Beerenhof" – a bear‐themed restaurant located right on the square (Beestenmarkt 26). Furthermore, the Italian restaurant "La Fontanella" (Verwersdijk 30) offers a 10 Euro meal deal for a main course (choose between several pizzas and pastas) and a drink for early diners on weekdays. Want some history to go with your lunch or dinner? Just join one of several Food Tours offered by Happy Day Tours Delft. You could stay at the Johannes Vermeer Hotel. But if your budget doesn't stretch that far (mine didn't either), I would recommend the Hotel Coen. The rooms are small and simple, but the hotel is reasonably clean and offers a good buffet breakfast for an extra 10 Euros. Location is king here as Hotel Coen is located right in front of Delft's main train station and the tram stop to The Hague. It's also pretty close to the historic centre of town. Walking there will only take you about 10 minutes. Disclosure: In order to write my review, I received a complimentary Vermeer Combiticket from VVV Delft, complimentary museum entry from the Mauritshuis Museum as well as a complimentary ticket for the Delft City Tour from Happy Days Tours Delft. The views expressed in this blog post, however, are entirely my own and thus reflect my personal, unbiased experience.